Jambeaux, everyone!!! Welcome to another episode of the Magic Our Way podcast. We are a New Orleans based Disney fan podcast. We appreciate your listening to our show and we hope it brings a smile to your face. We also appreciate your feedback and are committed to listening to our audience. In today’s episode, we are talking about the Dis dining Agent Controversy. 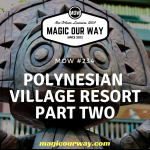 We have Danny; Lee, a travel agent with Magical Moments Vacations; and Eli of www.ivorycomcs.com for this episode. On today’s show, due to popular demand, Eli steps into the hosting chair while Kevin is out and gets a surprise guest welcoming him as host! 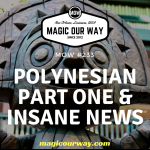 Also, in the queue, the boys discuss the closing of the Osborne Festival of Lights, the new Jungle Book trailer, and a potential remake of Mary Poppins. In Guest Services, Wreck it Josh chimes in on his upcoming race against MOW super-agent, Lee Lastovica who then drops a bombshell. Finally, in the Hub, the gang discusses the new app, Dis Dining Agent, that’s stirring up so much controversy. Does it go against every moral fiber of the Disney fan community or does it fulfill a need in the Disney universe? If you have any thoughts on the topic, be sure to share them at magicourway@gmail.com.